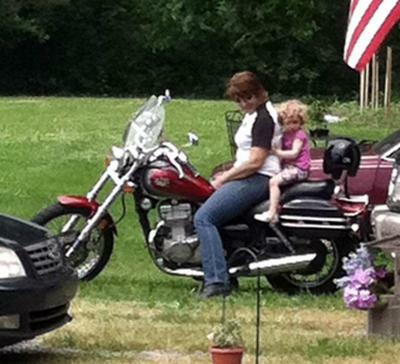 This my first bike (with my granddaughter seated behind me). I bought it on June 6 of 2011 and have ridden over 2500 miles since then, mostly by myself. With my husband getting his license this year, I'm sure I'll triple that in the year to come. Next year, we're both going to upgrade to bigger/newer bikes, but I'm sure I'll stick with a Vulcan. Fits like a great pair of jeans. I have an 01 Vulcan 1500 Classic. I got my endorsement Sept. 2011. I started with a Suzuki Marauder 800 I always felt top heavy on it. I am a big girl and thought I needed a bigger bike so my b/f found the Vulcan and I have to say when I first rode it I was in love. It has progressive shocks which lowered it some the balance of that bike it awesome. If I ever think of getting rid of it there will be another Vulcan in it's place. I just bought the identical bike 8 weeks ago.800 miles so far, many of them solo. It does fit like an old pair of jeans but I am finding it might not have quite enough power.My husband bought a Vulcan 900 last year. They are great bikes.